Ill be taking over from here. I hope Tam has been keeping you entertained for the past few days. Shes usually quite good at it  its amazing how she can get those tassels rotating in opposite directions. After a reasonable nights sleep, I awake around 8.00am, stagger into the bathroom and look into the mirror where a handsome, virile man looks back at me. How the hell he got into the stateroom Ill never know, so I kick him out and look into the mirror once again. This time I see a wrinkled old scrotum, which would be all right if it werent for the fact that Im looking at my face. Time catches up with all of us as I find out when I return to the bedroom to be met by a wizened old crone in the marital bed. Ah well, well just have to do the best we can with what weve got, so 30 minutes later Scrotum and Crone are ready to face the day ahead looking presentable enough that small children dont throw themselves overboard at the sight of us. Our first stop is Blu for breakfast where I have an omelette and toast, while Tam has muesli and a toasted English muffin. Both are nice and we agree that its a much more pleasant way to start the day than working your way through the scrum at the buffet. Next up we have the Cruise Critic meet. This is a cruise forum that has provided us with vast amounts of information regarding our cruise ship and the ports of call. We have also been part of a roll call for our cruise - through which we have booked three private excursions that are a lot cheaper than the prohibitively expensive ship tours. 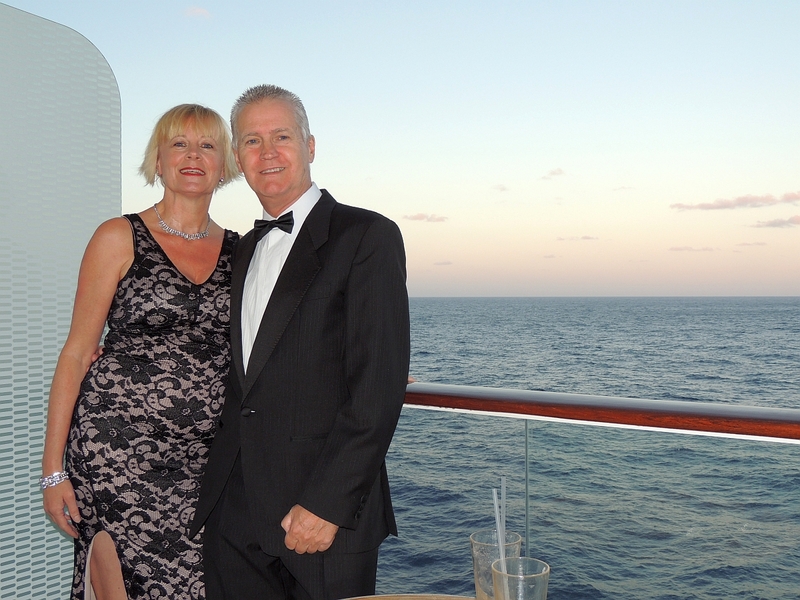 We meet the cruise director, a jovial, rotund American gentleman and a few other members of staff. We manage to find Alice, who is organising our Whitsundays and Bali tours and Linda with whom we are doing our trip in Darwin. Everyone seems very nice and a few details are worked out. After the meet we go to Guest Relations to sort out the drink package debacle - or rather the lack of it. A lady called Anshika deals with us and she informs us that Miami head office has confirmed we should get the free Classic drinks package. It takes 10 minutes or so to upgrade to the Premium package and cancel off the drinks we paid for yesterday. Anshika is very efficient and friendly and apologises for the mistake several times. Top marks to Celebrity for correcting the problem, but also for the friendliness of their Guest Relations staff. You can practically see the strain drain away from Tams face as the drinks package is returned to us. The old crone turns into a young woman again. Its time to start the serious business of relaxing, so we change into our swimming gear and go to the Solstice Deck. This is the highest and furthest forward of all the outdoor relaxation areas and has some comfortable sun beds. Amazingly, its very quiet with plenty of free places. I guess most people like to be by the pool and bar or are just too lazy to investigate to find the quieter areas. There are no children to be seen. One of the things we learned at the Cruise Critic meet is that there is a grand total of 28 children on board the cruise, which is an amazing figure when you consider that there are 2,662 guests on the ship. This is definitely the oldest demographic of any cruise weve ever been on. The average age is probably above 60. This is not a criticism, just an observation. Hell, when youve got a face like an old scrotum you are in no position to be maligning anyone. A couple of hours are spent enjoying the beautiful sunshine  its probably in the mid 20s centigrade. I write up my trip report and listen to lots of Australian music on my tablet, as I have to find suitable tracks for the holiday video. See, its not all fun and games on vacation, theres hard work to be done too. At 1.00pm we go to the Aquaspa Café for lunch. This places offers lighter, healthier food options and we feel smug as we eat salmon (Kev) and prawns (Tam). This is all well and good and we could claim to be incredibly virtuous if we didnt then go to Café Al Bacio for Tres Leches and Chocolate Cake. Back to the Solstice Deck for more lazing around before we walk to the Sunset Bar on the back of the ship for a couple of Rum Runners. 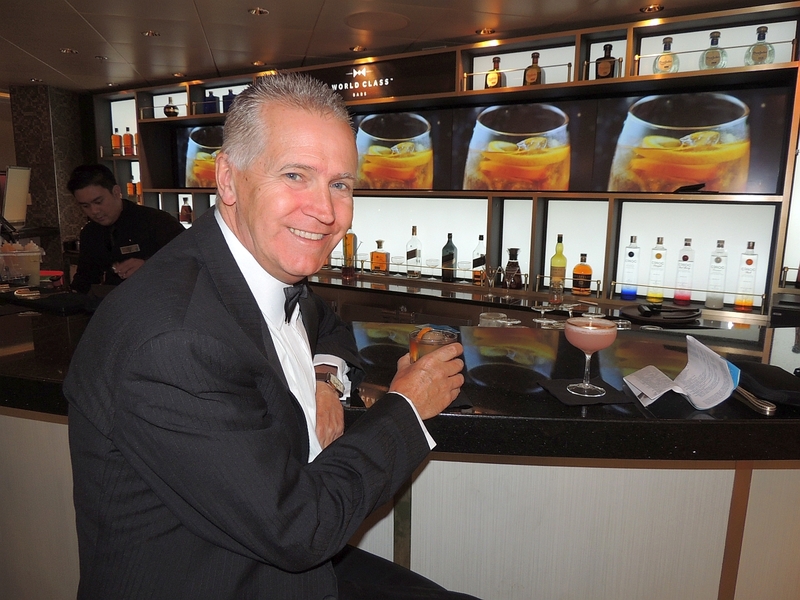 We watch the wake for a while and then go back to our stateroom to finish the drinks on the balcony. At 4.30pm we start to get ready for the evening. We are going to Silk Harvest for our 8.00pm reservation, but have important business to attend to first. At 6.00pm local time, tickets for Glastonbury Festival will be going on sale. Glastonbury is the most famous music festival in the world and tickets are notoriously difficult to get. You have to register by sending off your photo, which is then printed on your ticket should you be lucky enough to get one. This makes touting much more difficult. There will be approximately 120,000 tickets up for grabs, but likely to be more like 1 million people trying for them. Attire for tonight is Evening Chic, this used to be Formal Night, but Celebrity changed it last year to be less formal, which a lot of people are not happy about, but Ive brought along my tux, so Ill be wearing the little beauty come what may. At 5.45pm I am fully tuxed up and we attempt to go on-line using Celebritys exorbitant 1-hour internet package, which costs $18 per person. Oh dear. Failure. It wont connect. So Tam and I pick up our tablets and hightail it down the corridor dressed to the nines to get some help in the I Lounge. The help forthcoming is of little value as theres no one there. They should rename it the You Lounge. Tam jumps on a computer and I try to connect through my tablet. Luckily they both work. Tam is conversing with our daughters back home using Facebook and the next ¾ of an hour is the usual stressful Glastonbury ticket buying experience. Luckily India gets through and manages to get our 6 tickets (the maximum permitted), although many of our friends are not so lucky. Phew, job done, we can now celebrate. 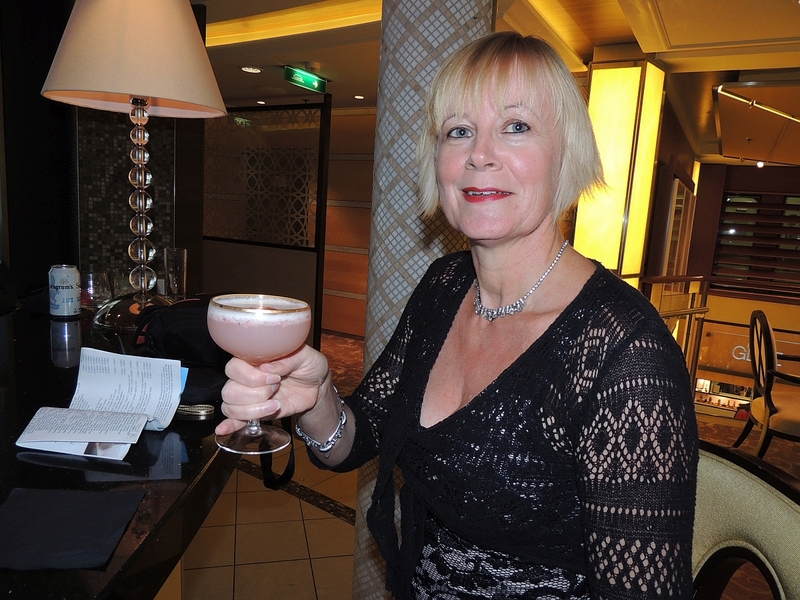 We drop our tablets off in the room and head to the World Class Bar for a cocktail. I have the Zacapa Old Fashioned (they use Ron Zacapa rum instead of bourbon) and Tam tries a Strawberry Field. Both are quite nice, but the Old Fashioned is a little too sweet for me. Dinner is next at Silk Harvest. 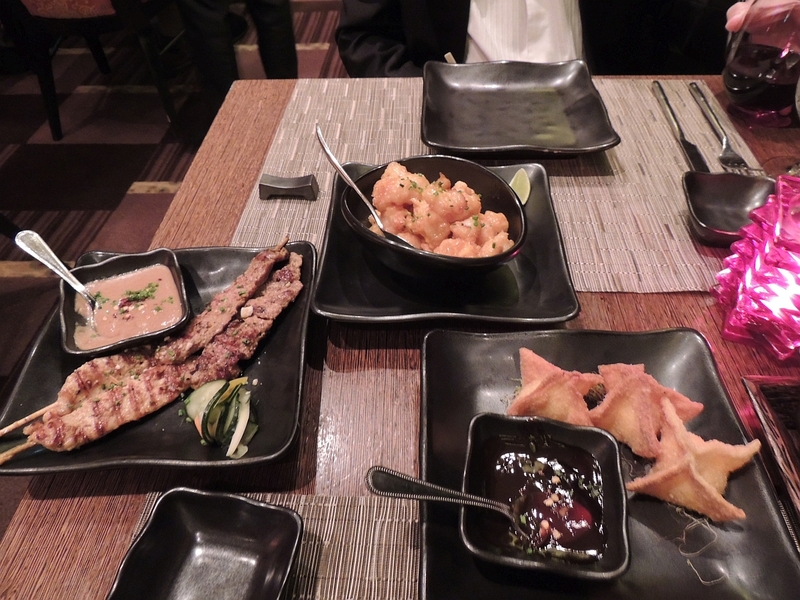 This is an Asian themed restaurant and you have several dishes to try between you. We have Tom Tom something or other soup, tempura shrimp, chicken satay skewers, cream cheese wontons, something porky and something else prawny. Forgive the inaccurate description, but if you want something more in-depth, Tam would have to write the report. She could probably go into great detail about every mouthful. One thing I can tell you is that it is all very nice. We talk to the couple at the next table and they tell us about the show they saw in the theatre earlier. They both enjoyed it, so after the meal we go to watch the last half of the second performance. Its a strange combination of the music of Mozart interspersed with modern tracks and a lot of dancing and aerial action on high wires. Still, its better than the awful Jersey Boys act of last night. Back to the World Class Bar where Rahadian and Loida (the bar tenders) make us drinks that are not on the menu. I have a Velvet Revolver (Loidas own bourbon creation) and Tam has a White Cloud. Mine is, again, a little too sweet for me, but Tam really likes her drink a lot. The World Class Bar used to be the Molecular Bar and had a much bigger menu. The drinks are still very nice, but the range is smaller. Our final drink of the night is a nightcap in the Ensemble Lounge. We have always liked this area as its quite dark and there is usually a small band playing. Tonight is no exception as a jazz quartet is on show. Tam has a White Zinfandel and I have an Anchor Steam beer. Oh, I forgot to say  Tam has been a right wally. She didnt apply the sun cream as fully as she should and there are areas of her body that are bright red. She looks like a red and white zebra with her clothes off. She gets a bottle of cold water from the bar, which she clutches to her inner thigh to cool it down. Classy people, eh? Cocktail dress, sat at the bar with a bottle of cold water in her crotch. I think it must be time for bed.